One of medicine's oldest known diseases, gout is a type of arthritis characterized by sudden, intense pain in the joints caused by the buildup of uric acid crystals. When the body breaks down chemicals called purines, found in some foods, it creates uric acid; when too much uric acid collects in your system, it forms crystals and causes painful inflammation. Reducing high-purine foods -- such as tuna -- in your diet can decrease your body's production of uric acid and the chance that gout will develop or reoccur. Gout sufferers should reduce or eliminate their intake of seafood that is very high in purines, including lobster, shrimp, anchovies, sardines, mackerel, scallops and mussels. In comparison, tuna is moderately high in purine. According to the Gout & Uric Acid Education Society, a 2004 study published in the "New England Journal of Medicine" found that each additional weekly serving of seafood led to a 7 percent increase in the risk of developing gout in middle-aged men. The Scarsdale Medical Group website recommends reducing your intake of meat, fish or poultry, including tuna, to 4 to 6 oz. per day to ward off gout symptoms. The USDA's "Dietary Guidelines for Americans, 2010" reports that the average American consumes about 3.5 ounces of seafood per week and recommends increased consumption. For an adult consuming a diet of 2,000 calories a day, the DASH -- Dietary Approaches to Stop Hypertension -- eating plan suggests a maximum of 6 ounces of lean protein, including seafood, per day. 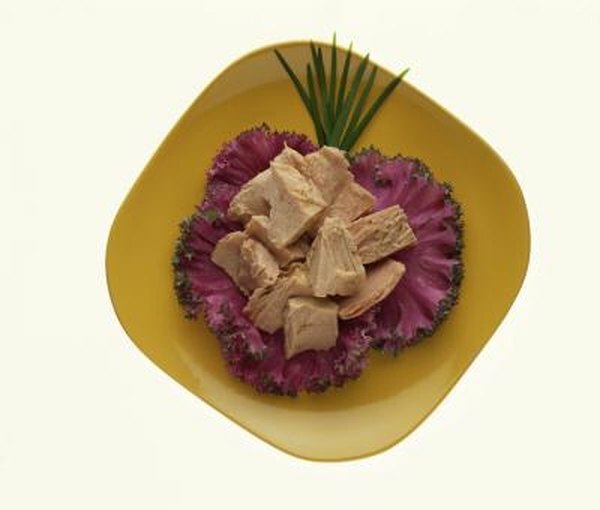 Tuna offers dietary benefits aside from its moderate purine level. It's a major source of omega-3 fatty acids, a type of polyunsaturated fat that encourages coronary health. The omega-3s found in tuna may also reduce the risk of diabetes, stroke, asthma, ulcerative colitis, some cancers and other conditions. This cold-water fish, whether eaten canned or freshly cooked, is a lean protein with much less cholesterol and saturated fat than in red meat. While tuna presents numerous health benefits for gout sufferers, some species are also high in mercury and PCBs. The Monterey Bay Aquarium's Seafood Watch program recommends avoiding Bluefin and some other species because of elevated mercury levels. American-caught Albacore and Skipjack, the most commonly canned species, are the safest. But canned tuna also contains high levels of sodium. Though salt is low in purines, people with gout should choose lower-salt varieties to maintain optimum overall health.